Will the team move to Laney College or Howard Terminal, or stay at the Coliseum location? 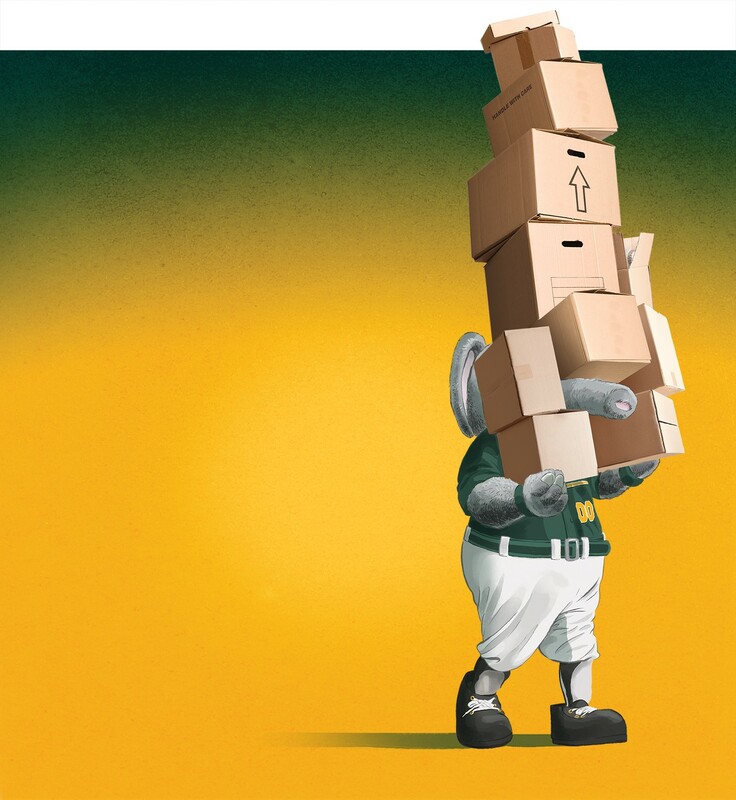 Where will the Oakland A's mascot Stomper be moving to? ... Our writer breaks down the team's possible new homes. Dave Kaval hopes to leave a mark on Oakland that will last a century. The new president of the Athletics is taking on what at one point seemed impossible: building a new ballpark for the team in the city. The A’s are seriously considering three sites. The decision is expected by the end of the year, potentially this summer, but almost certainly by the end of the current baseball season. At that point, Kaval says he’ll announce not just the location, but a timeline for construction. The three locations under consideration aren’t really new; all of them have been tossed around as potential sites for a new ballpark for a while: at the Laney College campus near Lake Merritt, at Howard Terminal west of Jack London Square, and at the site of the Coliseum itself. Each would have its own challenges to achieve Kaval’s vision of an intimate ballpark surrounded by a bustling “village” of bars, restaurants, and other attractions. “People are saying it would be great to have a ballpark village. So we’re trying to analyze the sites with that framework in mind,” Kaval told the Express. The catch is that none of these sites immediately stand out as a village. The Coliseum is largely isolated from any bars or restaurants; it was built in an era when stadiums were destinations unto themselves, and before Major League Baseball started favoring downtown ballparks. Howard Terminal was, until recently, an operating marine terminal, and is still surrounded by industry, though it is very close to nightlife. Laney College is surrounded by mostly residential neighbor-hoods, and the idea of a new ballpark could be met by fierce resistance from the college and surrounding community. 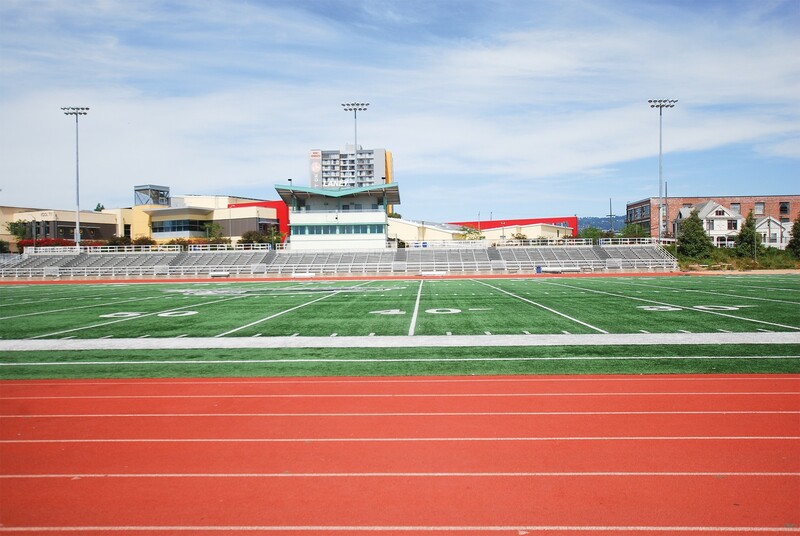 Recent media reports have suggested that the A’s are leaning toward Laney College, but are also very curious about Howard Terminal. Kaval disputed those rumors, saying that all three sites are still in play. “We think all of the final sites are awesome,” he said. The team president said he’s been conducting extensive outreach campaigns, holding town hall meetings with season ticket holders, taking polls of Oakland residents, and engaging with community leaders, including attending a party earlier in May thrown by Councilmember Larry Reid, who represents the district where the A’s play now. Until this season, the A’s seemed unenthusiastic (at best) about the idea of building a ballpark here. The team spent nearly a decade working to develop one elsewhere, first in Fremont and later in San Jose. One Oakland elected official even speculated that the team could move to Montreal or San Antonio. Wolff often said that his preferred site was the Coliseum. But with two teams potentially looking to build there — the A’s and the Raiders — there was both a race to get started first and also a stalemate waiting for the other team to make a move. For six years, Kaval was president of the San Jose Earthquakes, the Major League Soccer team also owned by Wolff and Fisher, and helped get that team a stadium built in 2015. Here in Oak-land, Kaval immediately started reaching out to fans who had long been spurned by the A’s ownership, suddenly espousing a commitment to the city, complete with the “Rooted in Oakland” marketing campaign, and by making nods to the team’s rich history (renaming the field after Hall of Famer Rickey Henderson, and putting a “Holy Toledo” sign in the park in honor of late sports announcer Bill King). He finally took the tarps off the Coliseum’s third deck, giving fans more seating options, and donated part of the proceeds to college funds for Oakland students. He says the new A’s ballpark will have between 34,000 and 35,000 seats, quite small for a Major League Baseball stadium, and a big shift from the Coliseum, which is one of the largest in the league, but has suffered from chronically poor attendance. The new park would have two decks, as opposed to three, with an eye to making sure there’s “not a bad seat in the house,” Kaval said. He seems to have an affinity for smaller parks, as the Earthquakes’ Avaya Stadium is the smallest stadium in Major League Soccer with 18,000 seats. He also said he’s not looking for a handout from the city, a sticking point recently in discussions with the Raiders, who left for $750 million in new hotel taxes in Las Vegas. Here, again, Kaval said his experience with the Earthquakes is useful, as their stadium was privately financed, as well. “The only way we know how to do it is with a privately financed stadium,” he said. Oakland Mayor Libby Schaaf also staunchly opposes providing public money for stadium development, only offering the Raiders $200 million in unspecified infrastructure improvements around the stadium site. “Unlike the Raiders, the A’s came fully prepared to pay for their own development,” Schaaf said. But while some of the team hasn’t asked for any infrastructure funds, whatever site they select will likely need improvements: to the roads and other public property surrounding it. While not taking city assistance for infrastructure off the table, Schaaf said she thinks the project would be competitive for other revenue sources, such as state and federal grants. But even if the A’s choose a site and pull together the financing for the development, they’ll still likely face steep logistical challenges, a lengthy public process, and potentially push back from the community. Any announcement likely wouldn’t be a sure thing, and won’t be until shovels are in the ground. This week, however, the Express digs in with a look at the three potential sites, weighting their pros and cons — and what battles will have to be fought before the A’s have a new home. The cranes at Howard Terminal, as seen from Jack London Square, would make for a postcard-worthy ballpark site. But some worry about access to the location, which is part of the Port of Oakland. Closest BART Station: 12th Street and West Oakland stations, both about a mile. Closest Freeway Exit: Interstate 880 exit at Market Street, about five blocks away. What’s Good? Have you seen that rendering of a ballpark nestled in the port’s cranes? It would immediately make the new A’s home iconic. Oakland’s potential answer to the Giants’ AT&T Park, complete with gorgeous waterfront views and easy access to bars and restaurants. It’s every bit of Kaval’s vision. What’s Not? It’s the least accessible site via public transportation, and would need a lot of in-vestment to make it workable for a ballpark, including finding some way to keep legions of drunk fans from killing themselves while crossing the nearby railroad tracks. 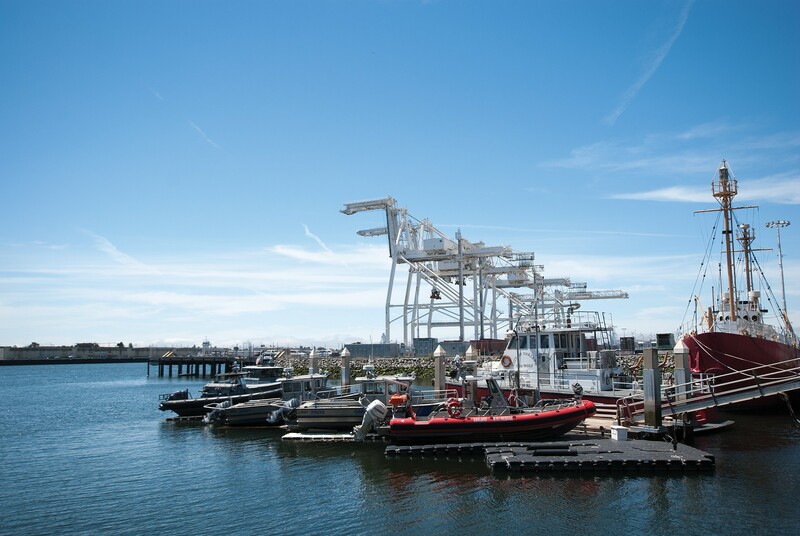 The easternmost terminal in the Port of Oakland, Howard Terminal has been discussed as a possible home for the A’s ever since its previous occupant, SSA Terminals, sued the port and reached a settlement in 2013 to move elsewhere. Before long, renderings of a waterfront park incorporating the site’s iconic cranes were being passed around. Former Mayor Jean Quan championed the site as a solution to finally keep the A’s in Oakland, and it’s since become Schaaf’s preferred spot, as well. For all the hype around it, though, the A’s ownership under Wolff often said they’d looked into the site and found it not viable. Kaval put it back on the table, however. There’s been some hand-wringing over the distance from the site to a BART station, but it’s only about a mile from two stations: 12th Street and West Oakland, roughly the same distance that the San Francisco Giants ballpark is from the closest BART. Not only that, but it’s just a few blocks from the highway, and adjacent to the Jack London Square ferry terminal. A ferry ride on a warm summer evening would become a favorite option for fans coming from Alameda or San Francisco. But a persistent concern are the train tracks running along the Embarcadero. These tracks al-ready can be hazardous for pedestrians, such as when two members of Tower of Power were hit by a train this past January, before a scheduled show at Yoshi’s. The logistics of thousands of fans walking to and from the park on a near-nightly basis pose grave safety issues. Some have floated the idea of bridges, which would need to be constructed, to accommodate fans. Some of the companies operating at the port also might raise objections to should the A’s try to build there. In 2014, three port stakeholders — the California Trucking Association, Union Pacific railroad, and Schnitzer Steel, which operates a recycling center at the west end of Howard Terminal — sent a letter to Quan raising several concerns about the compatibility of the site for a ballpark given its heavy industrial uses. “One of the justifications for locating the stadium at Howard Terminal would be that it would create a new walkable and stadium-supporting community and businesses, yet the uses immediately surrounding the terminal are not compatible with these goals,” they wrote. The also cited traffic issues that could bog down the fifth largest port in the country. To build there, the A’s would need to submit a proposal to the port, which potentially would compete with more traditional uses. At the moment, the port is also looking to find a tenant for its second-largest terminal, after Ports America pulled out of a 50-year lease, and its local operator, Ports America Outer Harbor Terminal, filed for bankruptcy. Port spokesperson Michael Zampa said in an email that the port is open to the idea of a ballpark, but hasn’t received any formal proposal from the A’s. Before it was a marine terminal, the area was a gas plant, until 1961, and portions of the 50-acre site are potentially polluted with polycyclic aromatic hydrocarbons and petroleum hydrocarbons, according to the state Department of Toxic Substances Control. It’s been capped with asphalt for some time, so the exact extent of the pollution, and any necessary cleanup for construction, isn’t entirely clear. Those hostile to the Laney College proposal cite displacement of nearby residents and traffic as major issues. Closest BART Station: Lake Merritt station, less than half a mile. Closest Freeway Exit: Interstate 880 exit on Oak Street, also less than half a mile. What’s Good? Lake Merritt has become prime real estate, and an A’s stadium would only in-crease its desirability. What’s Not? The neighborhood is dense, and not with the bars and restaurants that Kaval hopes for. There’s a strong possibility of displacing some longstanding communities. The idea of building near Lake Merritt seems obvious — but it might also be the most challenging. The area is developed already, and the site the A’s are looking at is in use as district offices for the community-college district, and none of the potential spots are very big. In the past, the team actually examined a few different parcels near Lake Merritt, including on the opposite side of Interstate 880, in the Brooklyn Basin area. But Kaval said, at this point, their eye is on the Peralta Community College District offices, right across from Laney College’s own athletic fields. The site is 18 acres, while a ballpark usually needs about 12, he said. Building at Laney College is a fairly old idea, dating back to when Jerry Brown was mayor. But options for Kaval’s village of bars and restaurants could be limited. The surrounding streets sur-rounding are houses, not bars and restaurants, as well as the college itself. The risk of ousting nearby residents and businesses would be very real. One of the fiercest recent battles over public-land use and displacement happened in the area recently, when the city attempted to sell a public parcel on East 12th Street to a developer after conducting an incomplete public process. The developer’s plan for a high-rise apartment building fell short of the necessary affordable housing requirements. There were intense protests over it, including one that shut down a City Council meeting entirely, which eventually led to reopening the bidding process. If the A’s decide to build there, they might face pushback from the campus. Some reports in campus publication the Laney Tower have been downright hostile to the idea of an A’s ballpark, citing limited parking and the inevitable influx of foot and vehicle traffic. 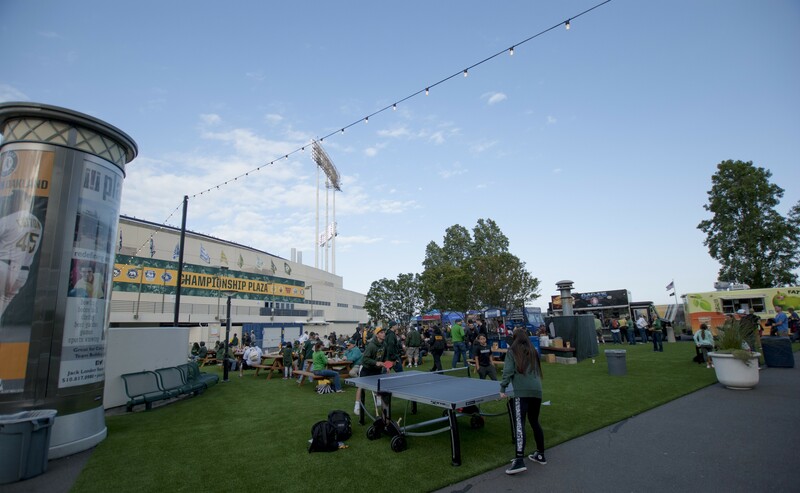 Under Dave Kaval's leadership, the A's added food trucks and games during certain A's home games this season. Some say staying at the Coliseum site is the path of least resistance. Closest BART Station: Coliseum station, 0.2 miles. What’s Good? It’s already a ballpark, so no one is going to get upset about building one there, and it’s the one with the best transportation access — by far. What’s Not? It’s a long way from being a “village,” and would buck the trend of downtown stadiums that Major League Baseball has been pushing for the last few decades. Earlier this year, Kaval called the Coliseum “the one site we know is 100 percent viable.” It’s easy to see why: There’s already a ballpark, and the expansive parking lot surrounding it leaves plenty of land to build on. At the moment, it’s a far cry from Kaval’s vision of a “ballpark village.” But even in that sea of concrete, he has already taken steps in that direction by introducing the new Championship Plaza outside the stadium, a hangout for ticket holders with food trucks. Scott McKibben, executive director of the Oakland-Alameda County Coliseum Joint Powers Authority, which oversees the Coliseum site, said that if the A’s decide to build there, the new stadium would likely go to the north of the existing Coliseum. The A’s could continue to play in the Coliseum and then just move next door. He said part of the process would be to find another developer for the site to build housing, perhaps a hotel, as well as restaurants and sports bars, creating a new village. “The Coliseum property is perhaps one of the best sports complex sites in the United States, and so we believe it’s an exceptionally good site,” McKibben said. Until this year, though, one challenge in building at the Coliseum was that it wasn’t clear if the Raiders would be leaving or trying to build their own stadium on the site. Now, it seems certain that the Raiders are leaving — but exactly when isn’t set in stone. The Raiders’ Las Vegas stadium isn’t expected to open until 2020. The team’s current lease in Oakland gives them options to play in the Coliseum for the 2017 and 2018 seasons, but there seems to be little appetite for extending that lease while they get their new stadium built. McKibben said that he thinks that is unlikely to affect the A’s construction timeline, since by the time the A’s pick a site, get a park built and get moved over, the Raiders will be long gone. If the A’s do leave, the future of the 120-acre Coliseum complex could be bleak. The City of Oakland and Alameda County would have to decide together what to do with a massive sports complex without any teams left — while still paying off debt from investment in the site during the Nineties. The Coliseum itself would likely be demolished. Oracle Arena might still be useful as a concert venue, and could even host sporting events, like NCAA basketball, according to McKibben. On the other hand, the entire site could potentially be razed for new development. In 2009, the New York Mets opened Citi Field, a replacement for the 44-year-old Shea Stadium. The new stadium’s brick exterior evokes Ebbetts Field, the iconic home of the Brooklyn Dodgers from 1913 to 1956. Planes from nearby LaGuardia pass overhead, and cars race by on the Whitestone Expressway. Surrounded on three sides by parking lots, a pedestrian bridge goes straight to the nearest subway stop, a nearly 40-minute trip to midtown Manhattan. The only street directly adjacent to the stadium is full of vacant lots and small auto repair shops. People still hang around the stadium before games, though, in bars and restaurants built into the side of the park that offer drink specials to attract fans. The ballpark is its own village. The Mets at one point had considered moving out of New York City altogether, or to Manhattan, but finally settled on the same site they’d always had. It’s fun to imagine the A’s in a shiny new ballpark at Lake Merritt or downtown, but at this point the path of least resistance is pretty clear: the Coliseum. On the other hand, the temptation for a waterfront ballpark to rival the Giants may be too great. Should the team and the city decide to move in that direction, a ballpark would definitely transform the waterfront or Lake Merritt. But it's difficult to imagine that the A's really want to pick a fight trying to build at Laney. For a team working to sell its connection to Oakland, an ugly feud over displacement would not be a good look. Correction: A previous version of this story incorrectly reported that A’s managing partner Lew Wolff threatened to move the team to Montreal or San Antonio. The death of Jesus Dickey of Berkeley has contributed to mounting concerns about the state of mental health treatment in the jail. A pair of West Oakland businessmen have been dodging city regulators and prosecutors for years as they reap the rewards of illegal trash disposal and dumping.